If you know my family at all, you know that they are history buffs, especially Pam and Rebecca. While most families would celebrate October 31st as Halloween, our family commemorates Reformation Day. In fact, earlier this week, Rebecca posted as her status on Facebook a line to Martin Luther’s hymn, “A Mighty Fortress Is Our God.” Typically, I usually lead the congregation in that great hymn on the Sunday before Reformation Sunday, but I missed it completely and almost missed putting it in the order of worship this week. The question is, why even commemorate the Reformation? We aren’t Lutheran. 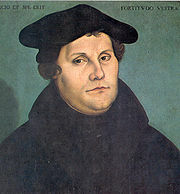 I will point to the fact that the Reformation is part of church history. It was a correction point. You’ve heard it said that those who forget history are doomed to repeat it. History is important in our lives and it is important in the life of the church. The history classes that I took (Wesleyan Church History and General Church History) were among my favorite classes at FLAME. The Church (big c, holy, catholic (little c-meaning universal), apostolic)has been around for a long time. As Wesleyans, we’ve only been around a short time, but we share a common history with the saints who have gone on before. (One of tomorrow’s posts will touch on that.) Blessings…. The Pharisees were a tricky bunch – those who are looking to the letter of the law are always a tricky bunch. They came and asked Jesus a question and Jesus answered it from their own scriptures, but added that they must also love their neighbor as themselves. I really believe that sometimes we make the gospel so complicated. Here Jesus summarizes the whole Hebrew scriptures into two statements. I love the Wesleyan Church vision statement which reads Fulfilling the Great Commission in the Spirit of the Great Commandment. The Great Commission is to go and make disciples of all nations and to teach these new disciples to follow all that Jesus taught us. We do that in the spirit of the Great Commandment – which is to love the Lord our God, with all of our heart, mind, and strength and to love our neighbor as ourselves. I’ve taught from this passage from time to time and I’ve often said that if we got these two statements in line – everything else would line up behind it. One of the teachers that Jesus was speaking to responded and Jesus realized that this man really understood what the Kingdom of God meant. My challenge to you today is that you would go and make disciples in the spirit of loving Jesus with all you’ve got and to love your neighbor and Jesus reminds us that everyone is our neighbor as you would love yourself. Blessings…. That describes the weather today. It started out damp and cool, but this afternoon was really gorgeous. The leaves have passed their peak now, but we are still enjoying the colorful display of the leaves. These have been some beautiful weeks here in the Shenandoah Valley. Big news! The sheet rock is installed and sanded. We are ready for paint. All the trim is painted and is ready for installation. HVAC is completed except for trim items. The best news is that our local power company came and finished the electrical hookup. So there is now power at the house and we can now have heat for laying tile and electric for finishing the floors. Everything is really coming together now — it shouldn’t be long until we make the move to Staunton. This week I began training to drive as a substitute for Augusta County Schools. Tonight I finished day 3. I want to thank my great group of volunteers at church who helped me out tonight. Thanks a ton — you guys are great. I am learning a lot about transporting students. We finish up next Monday night with the classroom training and then its on to road training. Yesterday, we had high speed internet installed at the church. Yea!!! I spent some time getting the modem working and tomorrow I need to spend time in the attic running Cat 5 cable to the router. At the moment you can get internet in the storage closet, but that should change tomorrow. I already mentioned how well my run went this morning — that only means that I will need to begin to work harder to get the same results. The good news is that I have lost another pound or two. I didn’t weigh myself until this afternoon, after we had had lunch. I still had a one pound loss despite that. I plan on getting a better measurement tomorrow. That’s about it — tomorrow will be another big day and Sunday is Friend Day and we are expecting a big crowd. Looking forward to it. Seize the Day. Several weeks ago I mentioned that one of our college profs, Dr. Keith Drury, was doing a series on the Pilgrim Holiness Church. This was one of the two churches that merged to make The Wesleyan Church. Here are the links to the entire series so far. I have been following this series with great interest. I was only 5 when the two churches merged, but my family was in the Pilgrim Holiness church. I have also had the opportunity to pastor several former Pilgrim churches. I’ve mention before on this blog that I fell in love with The Wesleyan Methodist Church history. There are some great stories associated with the founding of The Wesleyan Methodist Connection. The history of the Pilgrim Holiness Church was never as exciting (that is until now.) I have really enjoyed this series of Dr. Drury’s. Over the last few weeks, it has become apparent that the founders and those who were part of the Pilgrim Holiness Church were passionate about the gospel. They were passionate about seeing the sinner converted. They were passionate about seeing the converted come into a full relationship with God (or sanctification.) The did this through revivals — camp meetings — evangelism and a whole host of other things. This little denomination doubled the amount of churches between the years of 1930 and 1946. It was missional before missional was a word. It really is quite an amazing history. As I have been reading this history, it has been my prayer that we would and could recapture this sense of urgency and passion that our early church fathers and mothers had for the lost. They were people of prayer and devotion. All I have to do is think back to that little country church in Pocono Lake, PA and remember my great aunts (especially on a Sunday evening) coming in before the service and praying out loud. I remember the prayer services around the altars of the various Pilgrim and Wesleyan Churches that we attended in Orefield, Allentown, and Pocono Lake – they prayed with passion and all at the same time — they prayed for the lost to be saved — they prayed for full salvation for the converts — they prayed for their pastor — they prayed they they could make a difference in their communities — oh that we could recapture that sense of passion for our Savior, Redeemer and Friend. What a legacy to pass on to the next generation! Wow, what an amazing week. Since I normally start by writing about the weather, I will mention that first this week. The Fall Foliage peak is here in the Shenandoah Valley. It is absolutely gorgeous. Our drive to church this morning was a thing of beauty. I am absolutely amazed at the beauty of this place. We also took some pictures yesterday where the clouds were hanging over the mountain just behind our house. It has warmed up and the weather is back to more normal temps. This afternoon, I decided to go out running since it was a nice day and it was a scheduled run day. I took off for my normal 4 mile run but was on a much stronger pace — leaving me well short of my goal. The stronger running pace meant I “ran out of gas” at about the 2 1/4 mile mark, leaving me to walk home. The strange thing is that the entire 4 miles only took an hour, which means those first two miles had to be at a pretty strong pace. Looks like my run on Friday got me overly excited — but you do need those strong, fast runs to build up speed. The house continues to move along. This week the power company ran power most of the way to the house — we are now waiting for them to hook up the meter and then we should really move along. The house is now completely insulated and fully drywalled. When I looked in this evening, there was at least one coat of spackle on the walls. Almost all the exterior work is done including some nice columns on the front porch and the gutters and downspouts are done and the exterior lighting. It is looking very nice. We had a great morning of worship — our handbell choir played this morning and did a great job. The worship team sang their hearts out. Pastor preached a great message. It was a good morning. This evening we gathered again for our Christmas musical rehearsal and that continues to progress along very well. Looks to be another exciting week and I’ll keep you posted. Seize the Day!